We continue now with our discussion of personal finance for students. A study in the United States found that eighty-four percent of undergraduates last year had at least one credit card. Half had four or more. Borrowers who do not pay their card debt in full each month have to pay interest on whatever balance remains. 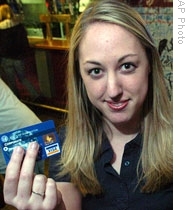 Brea Thompson a student at Washington State University in 2005 shows her credit card. A new law will make it harder for banks to give credit cards to people under 21. Student loan company Sallie Mae did the study. In a time of economic downturn, it says, college students are depending on credit cards more than ever. It says many seem to use them to live beyond their means -- to spend more than they have. More than three-fourths had to pay finance charges last year because they carried a balance. The average balance was more than three thousand dollars. Last Friday, President Obama signed into law a credit card reform bill. It includes protections for people under the age of twenty-one. To get a credit card, they will need a parent or other adult over twenty-one to accept joint responsibility. Or they will need to show they can repay their debts independently. Colleges will have to make public any agreements with credit card marketers. And credit card companies may not offer gifts on or near a campus to persuade students. Also, schools are urged to consider limiting the number of places on campus where companies can market credit cards. And they are urged to offer credit card and debt education and counseling sessions to all new students. The new measures from Congress take effect in February. Getting a credit card can already be difficult for international students. College advisers say those who want one might consider arriving with one from home. Debit cards withdraw money directly from a bank account. But advisers say these can also be difficult sometimes for foreign students to get. A good source of advice about local banking is a school's international student office. At Penn State, for example, adviser Pat Coleman says they have worked with local banks to make banking easier for international students. Students are generally advised to budget around one to two thousand dollars for expenses for a school year in the United States. And that's the VOA Special English Education Report, written by Nancy Steinbach. Our Foreign Student Series is online at www.unsv.com. A correction: George Mason University is advising the American University of Ras Al-Khaimah, not in Dubai as we said recently. I'm Steve Ember.